The Entrepreneurship Summit is the flagship event of E-Cell NIT Trichy, jointly organized by General Electric and Ernst & Young. The 2019 edition, with the theme of "From Eureka to Unicorn, boasts of a plethora of workshops, informal events and formal competitions, discussion panels, business modelling competitions and guest lecture series, all dedicated to representing the journey that the theme speaks of, and to create a sense of excitement and allure to this journey and entrepreneurship in general. E-Summit ‘19 is organized with a vision to help students get exposed to entrepreneurship and alternative careers, provide opportunities to gain the knowledge and acquire the skills necessary to build their own ventures from the ground up with the help of a growing student and alumni start-up ecosystem in NIT Trichy. With cash prizes worth 3 Lakhs and a footfall of about 3000+, it is one of the largest Entrepreneurial Summit in South India. The guest lecturer for the inaugural event of E-Summit ‘19 on 15th February is presented by Mr. Harishankaran Karunanidhi, Co-founder, and CTO of HackerRank and also an Alumni of NIT Trichy. The valedictory speech is presented by Dr. N. Kamakodi - MD and CEO of City Union Bank. Investing Workshop: E-Summit ‘19, in association with the National Stock Exchange of India (NSE), presents "The Art of Investing", a workshop which will teach students and soon-to-be graduates alike the basics in dealing with funds, working with stocks and how to capture and grow what your monetary potential. Case Study workshop: E-Summit'19 presents the Case Study workshop in association with Ernst & Young (EY), designed to give an introduction to the concept of case studies and see problems from a consulting firm's point of view. 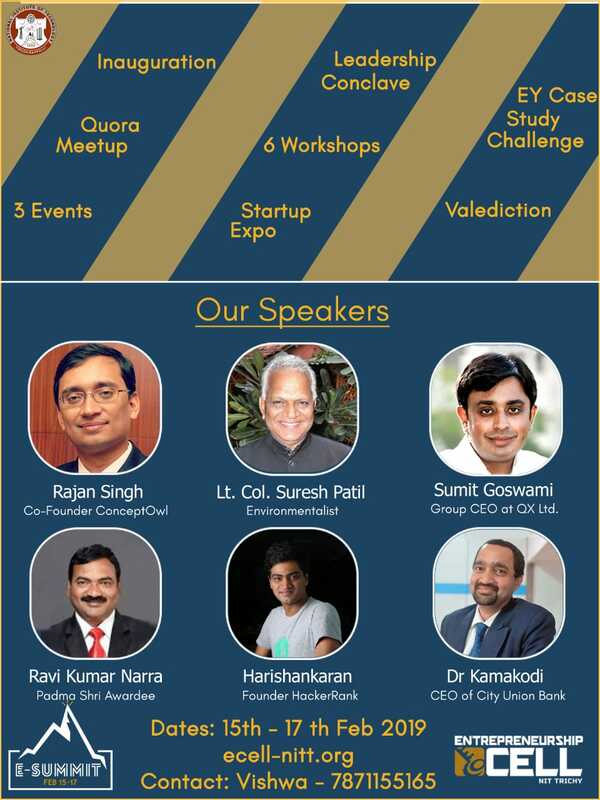 Quora Meetup: A meet 'n’ greet, Q&A session and lecture series all rolled into one, this first-of-its-kind meetup in Trichy promises to exciting and educational, with some of the biggest names in Quora, such as Rana Ashish, Programmer; Alcatraz Dey, Author, and Veteran among others in attendance. Pitch Fest is, as always, one of the events at E-Summit’19, where all you have to do is think of a good idea to pitch so that you can beat out the competition to get rich! Leadership Conclave: With esteemed guests from different walks of life, including but not limited to Rajan Singh, Ex-IPS & CEO of ConceptOwl, Garima Avtar, Extreme Rally racing driver, Lt. Col Suresh Patil, Veteran, Ravi Kumar Narra, Padma Shri Awardee talking about their journey to their current positions and voicing their opinions on various topics. Alumni Night is an event where students can engage in a networking session with the most successful and experienced alumni entrepreneurs. Informal events such as Startup Tycoon and Stock Market challenge to challenge students with the problems that entrepreneurs face and what kind of attitude you need to face and conquer them in a fun and engaging manner. Ventura is an international business model competition organized by E-Cell NIT Trichy. Being one of the largest Business-Model competitions in South India, it provides an ideal platform for emerging entrepreneurs to ideate, network, learn and grow. At E-Summit '19, the finalists from different tracks will pitch their idea/product to a panel of CEOs, Venture Capitalists and industry experts who will choose the most promising nascent startup among them. With a cash prize worth up to 2 Lakhs, it is guaranteed to be an intense showdown for the ages! Startup Expo is for students actively looking to engage in internships in Startups. With a wide range of profiles over a diverse array of startups in multiple locations, it promises to be a one-of-a-kind event. We at E-Cell NIT Trichy strive to uphold and disperse the spirit of entrepreneurship among students and professionals alike and contribute to the growing startup boom in India. Whether you are a professional with a fledgling startup or a student with a promising idea or just a curious soul, all you have to do is show up. Entrepreneurship Summit ‘19, Feb 15th to 17th at NIT Trichy.